My name is Bronson and I just celebrated my 13th birthday. I come from the villages of Faleasi’u, Vaiusu and Falese’ela. I am a direct descendent of his highness Namulau’ulu Lauaki Mamoe, the most well respected politician in Samoa to this day. The important piece I will elaborate on today is the Tuiga. The Tuiga is actually the Samoan version of the tiara. The tiara however only takes a split second to put on. You simply pop it on your head. But the Tuiga takes a good 30 minutes to put on properly. It can be a metre or so high and be very heavy. Now traditionally the Tuiga was only worn by those of high rank. But of course today things have changed and the Tuiga may be used by any of those who wish to dance whilst wearing it. It was and still is used during the Taualuga which is a traditional dance where all the villagers sit and sing while the person bearing the Tuiga dances in front of the village Matai or Chiefs. My grandmother the late Avalualagiaunoa-Taenefu received our Tuiga from my uncle from American Samoa, who actually makes them. Our Tuiga has been used during functions like the offertory, Polyfest, cultural groups etc. The first time our one was used was at the Polyfest. One of our neighbours’ daughters was the Taupou for Mangere College and they asked if they could use it. 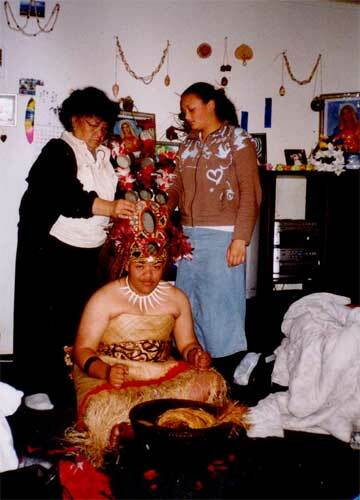 I watched my grandma put the Tuiga on the girls head. It looked very tight and very heavy on her head. She was told not to put her head right back while dancing just to make sure it didn’t fall off. I think the Tuiga is a unique piece and that it will survive and stay a tradition for years to come. By Bronson Namulau’ulu Malietoa-Tamafaiga Aerenga.